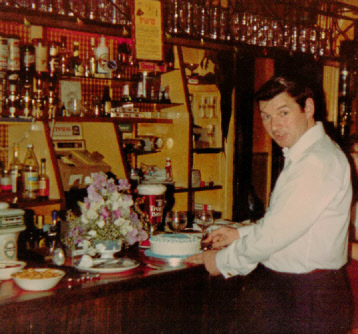 This account begins with (Godfrey) Martin King, landlord of the Red Lion, Preston in the 1970s. Mr King was a widower and a past chairman of Hitchin and District LVA. In the late winter of 1979, he returned to Preston with a new wife – his childhood sweetheart, Nita Jennings. They had married in the register office of their native Bromley, Kent where Mr King had been deputy superintendent registrar before the war. Less than two years later, in the summer of 1980, Mr King died, aged fifty-nine. His death was the catalyst for a turbulent period in the history of the Georgian pub. The owners, Whitbreads, decided that they should sell the Red Lion. 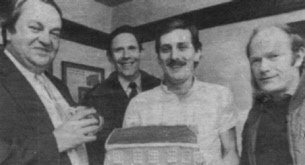 Ray Scarbrow (near right), who managed the Luton pub, The Somerset Tavern, and The Bull at Gosmore, decided he could turn the Red Lion into a large steakhouse-style restaurant. He therefore applied for planning permission for building extensions to the pub, a fifty-vehicle car park and a forty-one-seater restaurant. These plans met with intransigent resistance from locals. 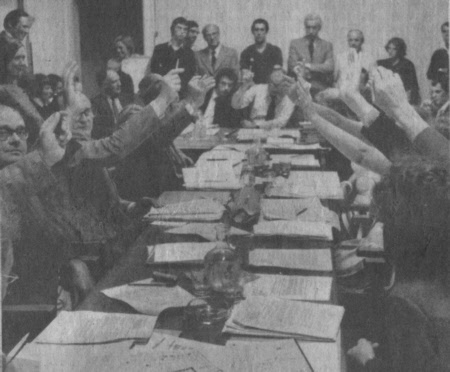 A protest meeting, that lasted 2½ hours, was held at the village hall in August 1981. 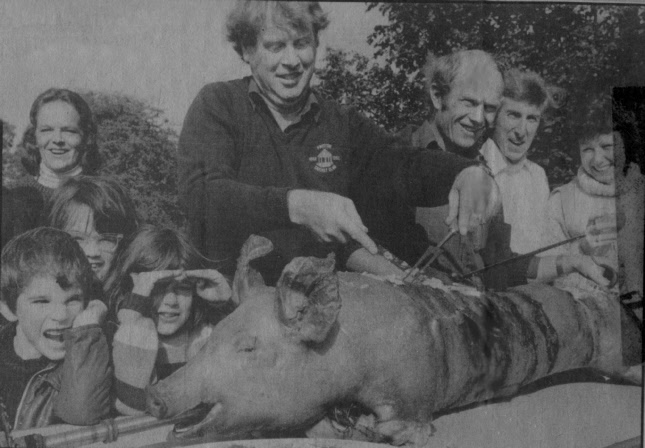 It was attended by most of the residents and chaired by Jack Raffell (far right), the chairman of the parish council, who had postponed a trip to Devon. Mr Raffell said, ‘It’s every village in North Herts with a nice village green and a pretty area that is in danger. They are all under the same attack as we are now....If he (Mr Scarbrow) wants to keep on, we shall keep on and wear him down’. The consensus was that Preston was a working village and needed a working village pub – not a roadhouse. They wanted a simple place where the cricket team, the darts team, the Hunt and the Morris dancers could meet and make merry. It was thought that the influx of outsiders to the restaurant would destroy the peace and charm of the village, cause noise late into the night and make the narrow lanes of the village a danger to children. New street lighting and pavements would spoil the character of the Green. Marjorie Pugh (of ‘Applegarth’, the Green) said, ‘We shall have car doors slamming late at night, parties coming at lunchtime and it will alter the character of the village completely’. Victoria Sowerby (of ‘Pryor House’) agreed, ‘To plan a two-acre site in a village of 350 souls is dreadfully worrying’. 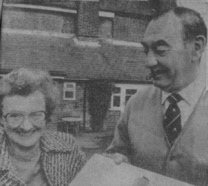 Betty Palmer (of ‘Kenwood Cottage’, the Green) said that her cottage would be affected on three sides by the proposals’. Mike Kellard (then, of ‘The Old Forge’, Church Road) added, ‘This is not a question of saving the Red Lion. It’s a question of saving Preston’. It was decided to write to the Director of Planning asking him to meet the village to discuss the plan and that home-owners in Preston should contact all thirteen members of the North Herts D.C. planning sub-committee claiming that the plans would significantly change the village and the conservation area and would not be in keeping with the character of the village. The planning committee was invited to another public meeting - when Preston Parish councillor, John Cook, intended to give them ‘an earful’. In a further strategic move the Parish Council also decided to approach the Hertfordshire Society and the Council for the Preservation of Rural England for help. The village gave Mr Raffell the go-ahead to approach a solicitor for legal advice and promised financial backing from their own pockets. For his part, Mr Scarbrow denied that the Red Lion would become anything but ‘a very nice pub with food. We certainly have no intention of it becoming another steak house. With the amount of money I am contemplating spending, the last thing I want is for it to become a disco. It will be a nice pub with dining facilities’. He added that he was not seeking a supper licence and did not envisage the premises being emptied any later than normal licensing hours. Mr Scarbrow continued, ‘It is an eyesore as it is. It is a pub that has been let go and is in desperate need of having money spent on it. The villagers will say they are all using it, but they are not. The trading figures show they are not....There are a lot of rumours of dances and discos. This will not be the case at all...I am sure we will win them over eventually’. At a later meeting with just two planning councillors, held six days before the application was heard, Brian Waters, (of ‘The Chequers’, who was in the chair) said, ‘It’s a good working pub, it’s not at all pretentious and we value it. It’s the social centre of the village and we need it’. 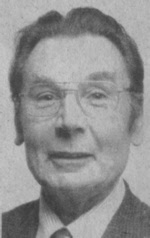 Councillor Fred Peacock, told villagers that although they had conducted a fine campaign they had ‘to find some valid reason to turn it down. It is unfortunate that the majority of objections that have been presented do not come into planning consideration. My reading of it is that it will be very hard to turn it down. I would lay two to one on it going through’. Councillor Ron Lodge added, ‘If this was happening in my village, I would be with you; you have done a really good campaign’. It was recommended that either a case was made that the extended pub damaged the conservation area or that the restaurant would constitute a significant change to the pub. However, planning officers were recommending approval of the scheme. The area planning committee met in the Council Offices, Grammar School Walk, Hitchin where one hundred people crowded into a small committee room. 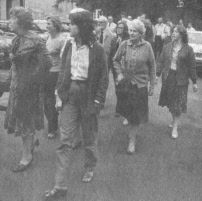 Many were from Preston (their arrival is shown, right), but there were around fifty from Hitchin and Gosmore who supported the planned changes. It emerged that the planners had been informed that the Secretary of State for the Environment had decided to make the Red Lion a statutory listed building. This meant that as well as obtaining planning permission for the alterations, an application for listed building consent would also have to be heard. It emerged later that the villagers had been instrumental in this decision being made. However, the listing of the pub was to have implications later, as we shall see. Various objections were raised by planning officers: ‘I cannot remember such public response regarding a conservation area’; ‘Here we have public participation. We either believe people have a voice in local government or we don’t. I think they have done a wonderful job’; ‘I do not believe the village roads could stand the extra traffic’; ‘A village pub would be turned into a roadhouse’. The committee unanimously refused the application, with one abstention (the vote is shown below). After the meeting, Mr Scarbrow said he would appeal to the Secretary of State, which would mean a public enquiry – ‘Even if it makes me bankrupt, I will go as far as the High Court’. He added, ‘Jack Raffell stated at a recent public meeting that they would wear me down. There is as much chance of that happening as a chocolate fireguard protecting their best carpet from hot cinders’. He also questioned Mr Raffell’s position: was he an unbiased member of the planning committee or a biased resident of Preston? Mr Raffell (who had lived at Preston since 1945 and of ‘Westleigh’, Church Lane) responded, ‘I dealt with this matter at the meeting firstly as a member of North Herts DC planning committee, secondly as a member representing Hitchwood, thirdly as a member of the Parish Council and fourthly as a resident of the village’. Most of the Preston people attending had been pessimistic before the meeting, believing that planning permission had been recommended. The clerk of Preston Parish Council, Robert Young, said ‘The great turnout of villagers for the meeting was far more than we expected’. Parish councillor, Frank Pugh, added, ‘We shall keep on fighting, even against the appeal. We will also fight Whitbread for improvements to the pub’. Mrs Carol Baines (right) said that she and her husband had already decided to sell up. They have a seventeenth-century house next to the pub - ‘We moved here in March to live in a quiet village, but it will never be like that again. On Thursday we received a phone call from a locally born man who wanted to buy a house in Preston, but he wanted to know the outcome of the planning meeting. He was delighted with the result and said he would continue with his plans despite the appeal’. Despite the fears of the villagers, North Herts DC rejected Mr Scarbrow’s application for planning permission. He promptly appealed the decision to the Department of the Environment. An organiser, Richard Beharrell (of ‘Chequers Cottage’), said, ‘We have got to have professional advice and it’s got to be paid for. We are trying to get people involved and make them aware that these things don’t just happen. The money has got to be produced by the villagers and I am glad to say they supported the event very well. It was extremely successful’. Whitbread’s noted these events. Because of the nuisance value of villagers, they decided there was no future in the plan for a steakhouse and so they offered the pub for sale as a free house. Would villagers who were prepared to put protesting pens to paper now be prepared to put their hands in their pockets? Whitbread’s priced the Red Lion at £125,000. A further £10K was needed for initial operating expenses. £95K was raised in Preston and a bank loan of £40K covered the shortfall. The response of locals laid to rest any doubts about what Preston thought of their pub. Retired builder, Frank Pugh who had lived in Preston since the end of the Second World War said, ‘It doesn’t take a genius to work out that if 92 households raised £95K a lot of people put in a lot more than £1’. All villagers living within three miles of the Red Lion had the right to own shares if it was their wish. All but a handful of the 130 Preston households took up their right contributing between £1 and several thousands of pounds. This was important as Whitbread’s had sought a reassurance that at least 80% of the householders would be involved including voting rights. A company, ‘Red Lion Limited’ was formed. All investments of £2 or more were divided equally between shares and loan stock. Once an initial outlay was made, no-one was liable for anything more. Any dividends would be paid on a sliding scale, depending on shares purchased. Any issues that arise, including the election of directors, are dealt with on the basis of one household, one vote. 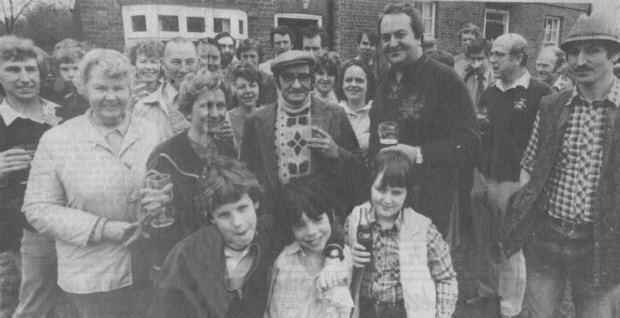 By Christmas 1982, the Red Lion belonged to the people of Preston. But what were they to do with their new possession? ‘Whitbreads kept their manager in until after Christmas and the pub closed on 4 January 1983’, said Mr Beharrell. ‘The place was in a terrible state because when a business is not doing well, one tends not to take a lot of trouble with it, so there was a lot to do. We had problems with the roof and the insulation – we had to change the staircase, the kitchen would not have met the health requirements and we had to create living quarters for the manager. ‘One of the problems was that during our campaign against the brewery we had the building listed, but of course that meant that when we took it over, we had to overcome all sorts of restrictions ourselves. We had to make major internal alterations but still maintain the external character of the building. But we did have a master builder, John French, who is one of the best people available at restoring old buildings. ‘We’ve been lost without it. There’s been constant activity here since we went into the drought on 4 January with people working from the top to the bottom of the building. Some people have put in so much work it’s been unbelievable. It’s a great credit to the enterprise of the village. From attic to the cellar, the pub was redecorated – walls were knocked down and a bar was made from a kit and an old church pew from Yorkshire. Everyone who was able to lend a skill – carpentry, decorating, expert advice or moral support – was mobilised. Older folk, who were unable to help, donated plants and trees. The professionals said they were very impressed with the way novices picked up new skills. ‘It was really quite amazing,’ said patternmaker Chris Newell, ‘Apart from a handful of us, no one had any experience but they knuckled down. I don’t think they knew quite what they were taking on’. 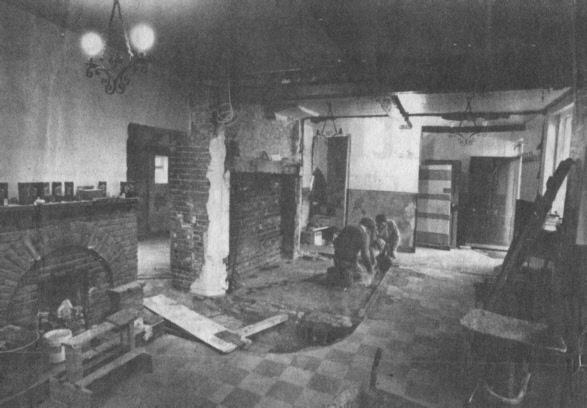 John French and his partner, Richard Maylin said that they had to replace perished timbers and brickwork and discovered in the nick of time that if they had stuck to the original plan to remove a fireplace, the whole building could have come toppling down. Victoria Sowerby, Ann Clark (of ‘Castle Farm’), Sue Griffiths (of ‘Windrush’, Back Lane), Margaret Cashin (of ‘Thurstaston’, Church Road) and Paddy Coleman-Smith (of ‘Latchetts’, Butchers Lane) reckoned they hung enough wall paper to cover the village green. Despite hiring some experts, work that would have cost the brewery between £50K and £70K was completed by volunteers for £30K. 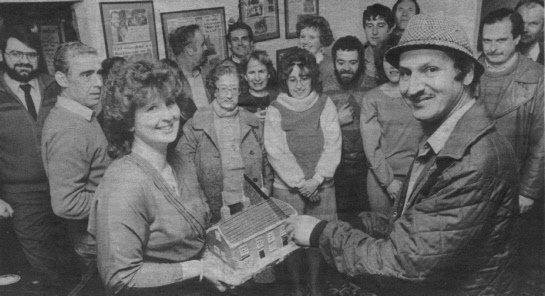 With jubilant celebrations, the Red Lion re-opened on 19 March 1983 – the final touches having been completed at around 05.00 over a bottle of Scotch. Youngest villager, three-month-old Gemma Newell (of ‘Elm Cottage’, Chequers Lane) ‘knocked’ on the front door which was opened by newly qualified managers, Roy and Kathy Hart. They had been selected ahead of fifty other candidates for their ‘youth, enthusiasm and energy’. Mike Bradley-Russell (of ‘Drift Acres’, the Green) said, ‘ Because they seemed to have exactly the same sort of aims for the pub as we did’. Farmer Ian Clark, who had tended 400 acres at ‘Castle Farm’ since 1969 summed it up, saying, ‘You’ve heard of the Archers and of the Bull at Ambridge, well that’s just what we want’. Mr Beharrell admitted that the first few months of the new enterprise were ‘a little shaky’. There were plans to turn an outbuilding into a children’s room and to improve the gardens. The renovated Red Lion is much bigger than it was, with a side room now a cosy bar and the new bar against one wall. It is basically one large room mainly carpeted but with a bit of stone flooring by the door. Two open fires create a cosy atmosphere. The villagers though had their wish – the Harvest Festival is held in the pub every year; the cricket club meets there as do the Enfield Chase Hunt and the Morris Men. The Queen Mother sent a letter praising the citizens of Preston for their enterprise. 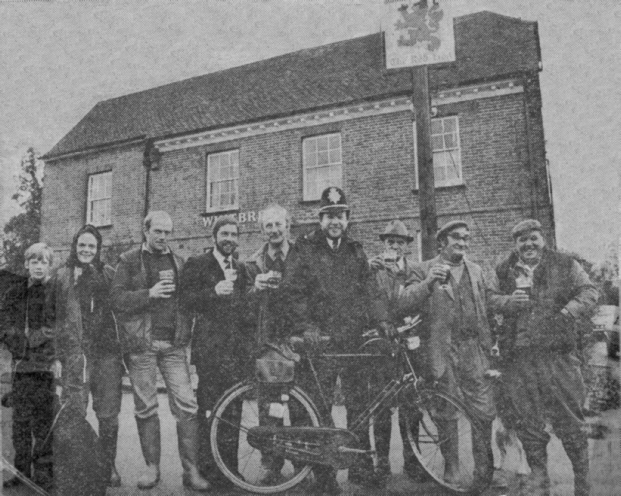 The story of the first community-owned pub in Great Britain was carried in the national and local press and has been featured several times on TV. In the 1980s the pub served a range of real ales including Greene King, Tetley, Youngs, Adnams and even Whitbreads. It has since earned several awards such as the ‘Pub of the Month’ award and ‘Pub of the Year in Hertfordshire’ from the Campaign For Real Ale (CAMRA). The exploits of the villagers resulted in their winning third place in a Village Venture Competition in Hertfordshire. The submission noted, ‘Everything is being done to ensure a rural, family atmosphere in the Red Lion where country hospitality can be extended to visitors...in short a village which could have been fragmented is now united and knows that it can maintain its rural atmosphere’. Mt Beharrell concluded, ‘It is supposed to be a hobby. The shareholders see it as a way of conserving something that is important to the village, not as a great investment. But as with anything, business or club, if you don’t work at it, you will lose it. We don’t want to lose our pub’. 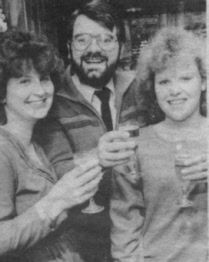 In 1986, on the third anniversary of the buy-out, a party of sixty people celebrated the success of the venture (shown below). The latest landlords were Alex and Carole Korodi. Carole said, ‘One or two sceptics said in 1983 the pub would last six months to a year but it has lasted a lot longer’. Just before ‘last orders’ on that opening day, Preston Hunt arrived at the door and the Master took a stirrup cup of beer. Mr Hart (shown right with Kathy) declared, ‘We now have all the things we love most. We are back in a village in the trade we love. It’s a smashing place. We intend to bring up our children (girls aged 2 and 4) and make our life there and become part of the community. We are thrilled to bits. It’s a dream come true’. Five months later the Hunts were succeeded by John Martin. Sixty-nine-year-old Harry Clark, who claims to be Preston’s oldest poacher – ‘I still carry my catapult with me in case I see a rabbit – said, ‘I bought my first pint in the Red Lion for 4d when I was 14. I didn’t want to see the pub changed. My motor doesn’t know its way from the other places like it does from here’. (Below, l to r) Richard Beharrell, Robert Young, Nick Ashman and Ian Clark. The company number is 01672560. The original directors included Robert Young, Richard Beharrell, Ian Clark, Brian Waters, Norman Harvey and Richard Sowersby. Since the inauguration of the company, directors have come and gone. Three new directors were appointed in 2003 and in 2008, the following were appointed: Andre Loustad, Clifford Cooper, Michael Knight, Leslie Edwards, Matthew Barnes, Philip Trinder, John Gill and Alison Jeffers. In 2008, the following directorships were terminated: Richard Sowersby, John Cook and Robert Young. As at 28 February 2011, the directors were: Andre Loustad, David Clark, C Cooper, L Edwards, Richard Gill, Alison Jeffers, Alex Knight, Howard Trinder, Brian Waters and Mark Waters. According to the 1998 accounts, shares valued at £95,390 had been issued and were held by 115 individuals, estates and companies. The number of shares owned per person ranged from £1 to £19,348. 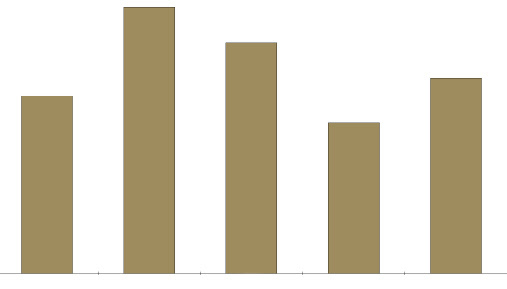 By February 2011, the number of shares issued had decreased to £92,392. The number of individuals (not households) holding shares had changed considerably (160) when compared with 1998 (115) - which reflects the movement of people in and out of the village, the deaths of some and other factors. Around forty of the 1998 shareholders do not appear on the list, but more than 80 new shareholders are noted. The number of shares in new hands was more than £40,000. If the holding of the majority shareholder is excluded, then almost 60% of the shares had been redistributed in 13 years. Writes Marion Gallacher: John Gallacher (right) and I were Holding Managers at the Red Lion from August 1980 until December 1982. The villagers were in discussions on what to do with the Pub at this time. Sadly Whitbreads in their infinite wisdom moved us out in the December to run the Adam & Eve in Hitchin and would not permit us to stay over the Christmas and New Year with our friends in the Red Lion – they put in a Relief Manager for 3 weeks until the closure in January 1983. When we moved into the Red Lion in August we were given the run down on what goes on by various locals - Harvest Auction being one of them - that was to be held on 2 October (five weeks by my calculation) for 2 people not knowing what on earth it involved, we did well. Around £200 was raised that night, a very successful evening, and we looked forward to the following two. Generally it was a quiet, friendly pub catering for the locals and their needs: village days, Royal Wedding, darts nights and occasional events were well and truly catered for. While John and I were running the Red Lion we got married and had our son Stewart, an original Prestonite, born April 1982.